In several articles over the last few months, I have been documenting the following simple point — it is the age of fake news, and political parties across the world have used it, or are using it. My forthcoming book, Citizen Raj: Elections 1952-2019, has a chapter, “The Birth of the Fake and Faulty Twins” where I stress a simple point: Conceptually, it does not benefit an incumbent (especially one with an outright majority) to disseminate fake news. That can only backfire. However, fake news can benefit a challenger who can throw any accusation — as Donald Trump did in the US elections in 2016 — leaving the incumbent to try and prove the impossible. On March 15, 108 economists and scientists released a letter, “Economic Statistics in Shambles”, which was published in the prestigious Economic & Political Weekly. The letter accused the Narendra Modi government of suppressing data. It is worth quoting a few sentences from the letter. “For decades, India’s statistical machinery has enjoyed a high level of reputation for the integrity of the data it produced on a range of economic and social parameters. It has often been criticised for the quality of its estimates, but never were allegations made of political interference influencing decisions and the estimates themselves. Lately, Indian statistics and the institutions associated with it have, however, come under a cloud for being influenced and indeed even controlled by political considerations. The new GDP series, which is a major part of the complaint, replaced the existing industry level data (as compiled by the CSO as the Annual Survey of Industries (ASI) and released with a two-year lag) by the more-timely Ministry of Corporate Affairs (MCA) balance sheet data on Indian industry. Unfortunately, these data do not go further back than 2006 and hence the controversy on GDP back-series has arisen. On March 14, a day before the news of “suppression of data” and “political interference” towards manipulation hit the headlines, first revised estimates of ASI data for 2016-17 were released on the CSO website. The preliminary estimates were released on March. This rich source of data is examined below to shed some light on the concerns raised by the economists and scientists. In my experience, I have never come across such criticism, let alone accusations. The list of economists who signed the list, are a virtual who’s-who of the Indian economic establishment (both domestic and NRIs). I know many of them, and have enormous intellectual respect for several of them. What they say has to be taken seriously by all concerned, especially the government. In my next article I will examine in detail the accusations concerning the Periodic Labour Force Survey (PLFS) for 2017-18 which the government has stubbornly, and inexplicably, refused to release — till date. Regardless of any complaints that the government may have against the “accuracy” or representativeness of the PLFS data, there is absolutely no basis for not releasing the data. In this regard, I am with anyone who states that the unit-level data (and not just the report on the PLFS data) should be released immediately. The government should realise that when it does not release data as per schedule, the immediate, and not incorrect, assumption is that it has something to hide. One of the biggest economic stories of our time (both in India and abroad) has been the decline in inflation rate to very low levels. This process has been going on in the world for more than 20 years; its influence was masked in India by the extraordinarily high inflation inflicted on the Indian economy by the UPA governments I and II (especially UPA II). Curiously, when it comes to evaluation of GDP growth rates, the 108+ economists are quick to point out (in separate writings over the years) that India has benefitted from the oil price decline in the Modi years, post 2014. But they don’t point out how GDP growth benefitted from explosive global growth in UPA-I; and how the Indian macro-economy was severely affected by high inflation post the 2008 financial crisis. The accompanying graphic looks at ASI data on three important economic variables — net value added, wages to workers, and the number of workers. In addition, data on two price indices — CPI and WPI — are reported. The latter two are needed to analyse the ASI information in terms of real growth in value added, and real income of workers. Worker income is deflated by CPI; industrial value added is deflated by WPI for manufacturing. Data are available for only three of the Modi years — 2014-15 to 2016-17. ASI data is available since 1981. If three years post and pre-2014 are taken, then a valid comparison can be made between the UPA-II years and the NDA-II years. Note that the terminal year for the Modi period is 2016-17 — the year of demonetisation. This selection of the demonetisation year biases all the results in an anti-Modi direction; all critics believe that demonetisation caused a severe dent in employment and output. What does the data show? First, the unambiguous record on decline in inflation. CPI inflation declined by 400 bp, from an average of 9 per cent to an average of 5 per cent. WPI for manufacturing declined at a slightly faster rate by 420 bp. The aggregate WPI inflation (not used in our computations) declined at a faster pace, 710 bp. Now let us look at output growth. The 108+ experts believe that the new 2011-12 series is flawed. The new series is based on the MCA industrial data. But here, even according to the old ASI base, industrial growth in value-added during the Modi years was at a substantially higher pace than the UPA-II years — 7.5 per cent for the net value added, an acceleration of 440 bp a year, on average. One of the suspicions of the 108+ is that GDP growth rate in 2016-17 was artificially, and superficially, boosted. But what the old, ostensibly more reliable ASI data, show is that the Modi years have been rather good for output (GDP) growth. But what about wages? The allegation is that there hasn’t been much increase in wages. It is true that nominal wage growth has declined from 13 per cent to 10.5 per cent. But inflation declined by a higher amount, thus yielding faster growth in real wages. But what about jobs? Job growth must have been terrible, which is why the PLFS data are being suppressed as per the dissident economists. 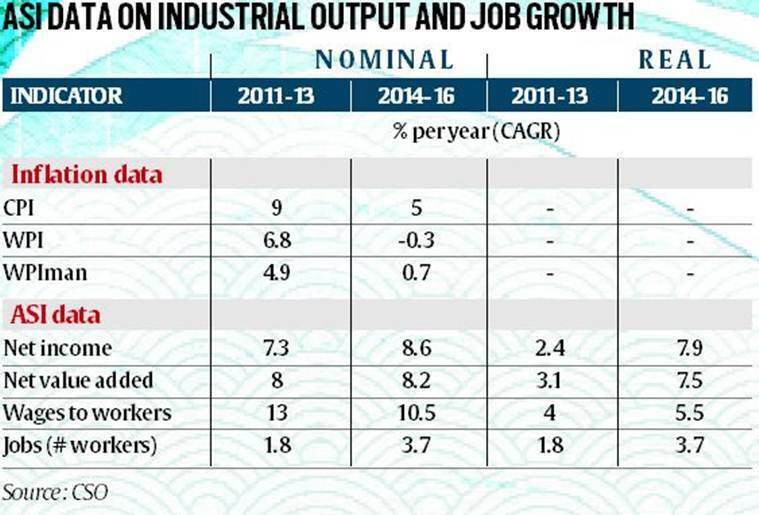 But according to the ASI data, employment has grown at more than twice the rate in the three NDA-II years than in the preceding three UPA years. The ASI employment data is also consistent with other sources of formal job data — for example, EPFO. It should also be noted that around the world, establishment surveys are being preferred to household surveys on jobs — on unemployment, the only source are household surveys. We conclude as follows. There is no denying the reality that the government has delayed the release of the PLFS data. For that, it should be criticised. The rest of the rather extreme accusations made by responsible academics need to be examined by other academics. Were they made in haste, or after honest, non-ideological considerations? Only future research can tell.